She was beaten to death and later run over by a tractor. 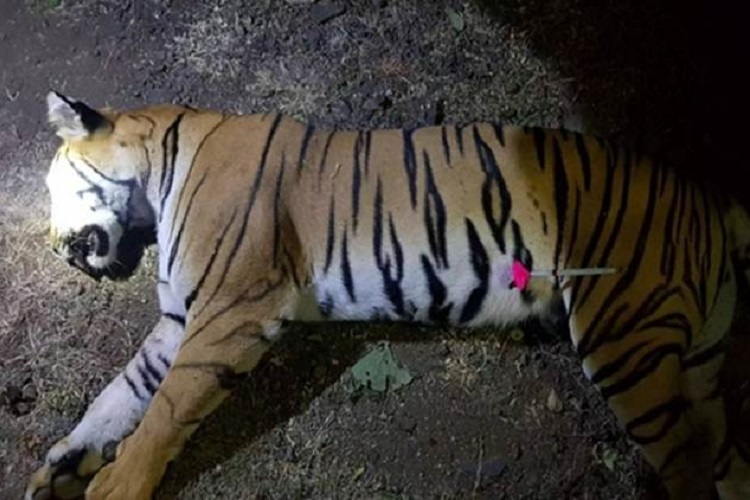 Amidst the controversy over the killing of Avni, a ‘man-eating’ tigress in Maharashtra last week, another tigress was beaten to death and run over by a tractor in Uttar Pradesh’s Dudhwa National Park. The incident happened on Sunday evening, when the residents of Chaltau village killed the tigress for allegedly attacking a villager. According to a report by the NDTV, the villagers barged into the core area of the park, allegedly assaulted forest guards, snatched a tractor and then ran over the 10-year-old tigress. She was also repeatedly hit with sticks. An FIR has been registered against those who were responsible for the attack. Six people have been identified and were booked under sections 147 (rioting), 148 (rioting, armed with deadly weapon), 353 (assault or criminal force to deter public servant from discharge of his duty), 332 (voluntarily causing hurt to deter public servant from his duty), 342 (wrongful confinement) and 506 (criminal intimidation) of the IPC, as well as various sections of the Wildlife Protection Act. Forest officials say that the villager who was attacked by the tigress entered the protected tiger reserve at his own risk. He later succumbed to the injuries. However, the villagers say that the animal had attacked their livestock several times because of which they were living in fear. Police have now launched an investigation. Arrests will be made soon after verifying the CCTV footage of the attack. The incident comes in the aftermath of the killing of Avni, who was declared a man-eater after she allegedly killed 13 people in the last two years. Her killing sparked a nationwide outrage. While the villagers welcomed the decision to kill her, many animal rights activists including union minister Maneka Gandhi expressed their disapproval. According to the data from the 2010 and 2014 censuses that were tabled in Parliament in March this year by the Environment & Forest and Ministry, there are 2,226 tigers in India. A 30 percent growth was recorded from 1,706 counted in 2010. Maharashtra’s tiger count grew 12% from 169 in 2010 to 190 in 2014, while populations remained stable in Uttar Pradesh (118 in 2010, 117 in 2014) and Odisha (32, 28). The count increased in most states, was stable in a few and decreased in only one, Jharkhand. The highest numbers in 2014 were in Karnataka (406), Uttarakhand (340), Madhya Pradesh (308), Tamil Nadu (229), Maharashtra, Assam (167) and Uttar Pradesh, reports The Indian Express.